Every Nov. 5 for three years running, the hacker collective Anonymous has held a Million Mask March in observance of Guy Fawkes Day. This year, hundreds of cities around the world saw thousands of protesters take to the streets to demonstrate, advocating for putting an end to systemic oppression, specifically focusing on police brutality as well as overall corruption. One of the largest demonstrations occurred in London. 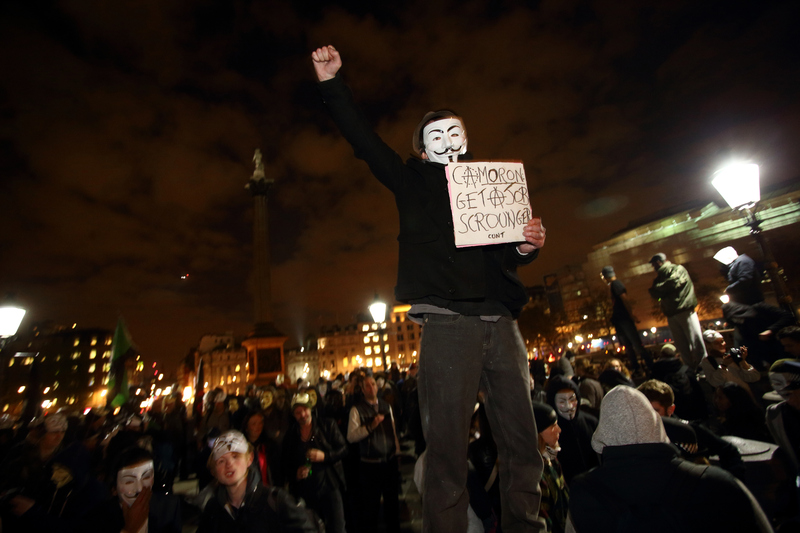 Photos from the Million Mask March in and around Trafalgar Square paint a picture of solidarity as well as strife. According to Facebook RSVPs, as many as 18,000 people indicated that they would be demonstrating. That number has yet to be confirmed. Police descended upon protesters following demonstrations going over an hour and a half past their designated stop time. At least three people were arrested and others have been detained for public nuisance-related offenses. Many were trapped in Trafalgar Square thanks to police kettling, a crowd control technique which forces a group to be confined to a certain area. Though a majority of the protests were peaceful, vandalism of police vehicles had been reported, along with a few demonstrators allegedly throwing objects including fireworks at police horses. The Guardian also reported an incident involving a 20-year-old who had claimed he was hit by a police officer's baton. London's protests also had a specific dress code: the obligatory Guy Fawkes mask, along with judicial garb that included a black robe and flowing white wig. Smaller protests, like Denver's, were less themed and more a show of solidarity.